In which, as the Oscars approach, we see one of the major studios continue to basically give up on theaters. Not that Paramount has put it that way, but after they sent The Cloverfield Paradox straight to Netflix a couple weeks ago and are allowing Annihilation to hit the streaming service internationally in a couple of weeks, what else are we supposed to think? Word is that Annihilation deserves a big-screen viewing, too, being a terrific sci-fi/horror flick from director Alex Garland with a killer cast that includes Natalie Portman, Tessa Thompson, Jennifer Jason Leigh, Oscar Isaac, and Gina Rodriguez. It's at the Somerville, Fresh Pond, the Embassy, Boston Common, Fenway, the Seaport, South Bay, Assembly Row, and Revere. Also out this week is Game Night, featuring Jason Bateman, Rachel McAdams, and a bunch of other funny folks doing a "mystery party" night only to wind up in the middle of an actual crime without realizing that this isn't just committed roleplay. It's at the Capitol, Fresh Pond, the Embassy, Boston Common, Fenway, the Seaport, South Bay, Assembly Row, Revere, and the SuperLux. Slightly smaller opening for Every Day, about two teenagers in love, made more complicated by the fact that one is apparently a disembodied spirit who occupies a new host daily. It's at Boston Common, South Bay, Assembly Row, and Revere. Boston Common also opens Nostalgia, which seems to be one of those overlapping-narrative things with a general focus on looking back; nice cast including John Hamm, Nick Offerman, Ellen Burstyn, and Catherine Keener. Fenway has all of Best Picture nominees playing throughout the week, while Boston Common has the first half of a two-week event on Saturday. Mary and the Witch's Flower also gets a couple more shows at Boston Common and Fenway, with an English dub on Saturday afternoon and subtitles on Monday evening. If you prefer puppetry to animation, there are screenings of The Dark Crystal at Fenway, Assembly Row, and Revere on Sunday and Wednesday. The Coolidge Corner Theatre gets Chile's Oscar nominee, A Fantastic Woman, as do the Kendall and West Newton. It stars Daniela Vega as a waitress and performer who, when her lover suddenly dies, is pushed away by a family instinctively hostile toward a trans woman. The monthly After Midnite Women in Horror series concludes this weekend with two recent sensations, The Babadook at midnight on Friday and Raw on Saturday. The Werner Herzog series also has a midnight entry on Saturday, when his version of Nosferatu the Vampyre (with Klaus Kinski in the title role) plays upstairs. Herzog also supplies the monthly Science On Screen show, a 35mm print Grizzly Man, on Tuesday with Harvard Medical School professor Steven Schlozman discussing why people do dangerous things. There's also Happy People: A Year in the Taiga, where Herzog narrates and is credited as co-director, having helped Dmitry Yasyukov put it together after Yasyukov filmed the people of a Siberian village. Along with A Fantastic Woman, Kendall Square and West Newton both open The Party, a dark black-and-white comedy in which a group of politically-and-personally-connected people come together and start to have their resentments boil up to the point where murder is possible. Nifty cast, including Patricia Clarkson, Kristin Scott Thomas (who barely seems to work in English any more), Timothy Spall, Cillian Murphy, Emily Mortimer, and Cherry Jones. The Chinese New Year wave of sequels isn't quite over; not only do Monkey King 3, Monster Hunt 2, and Detective Chinatown 2 all continue to hang around Boston Common (and Revere in the latter case), but Dante Lam's latest, Operation Red Sea opens at the Common. It's not really a sequel to Operation Mekong - it involves the army rather than the police, and no characters seem to cross over - and I suspect it may not have that movie's quality Hong Kong-style violence; the trailer looks like it is chasing Wolf Warrior 2 money. On the Indian side, Apple Fresh Pond continues Padmaavat, Pad Man, and Aiyaary. They also open Bollywood comedies Welcome to New York, with a repo man and a fashion designer meeting cute and chaotically in Manhattan, and Sonu Ke Titu Ki Sweety, in which the marriage between two people would be much smoother if it was not also a sort of marriage between their circles of friends. There's also screenings of Malayalam chase thriller Aadhi and Marathi drama Aapla Manus on Saturday and Bengali drama Roktokarobi on Sunday. The week's "hey, we'll put something otherwise going to VOD but with a recognizable name or two in an 18-seat room" release is Half Magic, with Heather Graham making her directorial debut and co-starring with Stephanie Beatriz and Angela Kinsey as three friends frustrated with men keeping them down, but with some magic candles to help wishes come true. The Brattle Theatre wraps up Bugs Bunny Film Festival with a 35mm "Looney Tunes Revue" playing matinees from Friday to Sunday. On Friday and Saturday evenings, they screen a new restoration of Powell & Pressburger's A Mattter of Life and Death, while Sunday night is the Boston Society of Film Critics' award ceremony, which includes a screening of Get Out. On Monday, The DocYard welcomes director Tala Hadid with House in the Fields, her documentary about traditional life in rural Morocco. There's also a free "Elements of Cinema" screening of Rashomon on Tuesday. Tuesday also starts "Painting the Frame: The Cinematography of Roger Deakins", with the first three days all featuring one or more screenings of his Oscar-nominated Blade Runner 2049, with Thursday also having a couple screenings of Fargo. She may have sent a cardboard cutout to the Oscar luncheon, but Agnes Varda will be at The Harvard Film Archive this week, introducing Faces Places on Friday and Vagabond on Sunday and serving as the Norton Lecturer in the Sanders theater on Monday and Tuesday afternoons. Her omnibus film, Cinévardaphoto, plays Sunday evening. Note that the Friday and Saturday shows have sold out to the point where they will be opening an auxiliary screening room next door, with Varda's comments being simulcast. They also welcome Robert Schaller on Sunday afternoon for a program of his short films (some on 16mm) with live musical accompaniment. Then they wrap up the Kevin Jerome Everson retrospective on Monday with "BSV" and The Island of St. Matthews. The Somerville Theatre begins the monthly repertory series Something of Value: Sidney Poitier on Screen this weekend, programming around other events in the main theater and apparently scrambling a bit with different prints: No Way Out was just going to play Friday evening, but now it also plays Saturday afternoon as a double feature with The Blackboard Jungle in the afternoon - and that movie plays with The Long Ships in the evening (Cry, the Beloved Country seems to have dropped from the schedule). Sunday's double feature is Edge of the City & To Sir, With Love; the namesake of the series, Something of Value, plays Thursday evening. 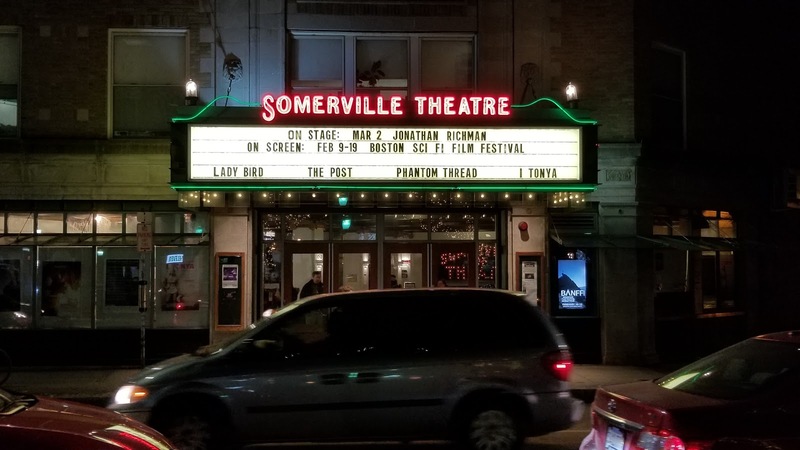 The Somerville also has the Oscar-Nominated Shorts during the week, with Animation on Tuesday, Live-Action on Wednesday, and a double feature on Thursday. The animated and live-action shorts also continue at the Kendall and West Newton while the Coolidge has the documentaries. The Museum of Fine Arts continues their run of three films - Tehran Taboo (Friday/Wednesday), Il Boom (Friday/Saturday/Sunday), and The Crime of Monsieur Lange (Friday/Saturday/Sunday) - through the end of the February Calendar. They also wrap up the Boston Festival of Films From Japan with Jellyfish Eyes on Sunday and Over the Fence on Wednesday. Emerson's Bright Lights has a film by one of their own on Tuesday, with professor Mike S. Ryan answering questions as the producer of Free in Deed, while faculty with no involvement in the production of Lady Bird will lead a discussion after that one on Thursday. The Regent Theatre has more Frozen sing-along shows this weekend - twice on Friday and Saturday, once on Sunday. The Institute for Contemporary Art wraps up the "Month of Sundays" this weekend with Bill Cunningham New York, also showing a selection of Sundance Film Festival Shorts later that afternoon. CinemaSalem plays Palestinian drama In Between in their screening room. I may or may not catch more movies while I'm away on vacation, but Annihilation and the long-delayed Oscar catch-up stuff are priorities when I get back. Maybe Game Night as well. One ore sequel to go for the weekend, but other big movie/vacation things are going to keep me from seeing Detective Chinatown 2 right away (I see that there is a theater in New Orleans playing that one, so maybe I'll do that on a rainy evening), and I'm drawn to the big FX spectacles anyway. From what I gather, Monster Hunt 2 is the really massive hit this weekend in China, but Detective Chinatown seems to have grabbed more theaters in the U.S., perhaps because the student/expat audience that sees a lot of these movies in North America doesn't have kids. Whatever the reason, the two family-friendly fantasies I saw were pretty darn decent, enough that I fear I'll learn the wrong lesson from seeing Monkey King 3 even though the first two were kind of disappointing. Their release as a whole is kind of interesting to me just in terms of how awkward these international releases can be - obviously, the Lunar New Year is a massive movie release weekend in China, much like Christmas, and Thanksgiving are in the U.S. and Diwali is in India, but even things with potential crossover appeal like Monster Hunt 2 get steamrolled because it goes up against Black Panther, which has a lot of screens, including almost all of the 3D ones. Both Monkey King and Monster Hunt strike me as potentially looking pretty good in that format, but the opportunity just isn't going to be there in America, which is a shame: There doesn't seem to have been the backlash against that format in Asia that there has in America, and both of these films had Hong Kong crews that are really good at using space in their action sequences. Anyway, even if these movies are playing in a theater that MoviePass doesn't currently support and Black Panther is (understandably) a priority, give some thought to checking them out. They're pretty decent on their own and the fact that they are kind of huge, popular hits - you will likely see MH2 on some year-end list of the biggest movies worldwide - means they've got pretty broad appeal and you've got a chance to see where movies will go as Hollywood continues to chase the world market. Sometimes, the third time apparently is the charm - despite a pair of less-than-impressive predecessors, director Cheang Pou-soi's third Monkey King film winds up being pretty darn decent. It's been a heck of a troubled path to get there, as the producers basically scrapped everything and started over at one point, and there have been at least two better takes on the same material while this series of movies has been a going concern, but on its own, this particular flick isn't a bad way to spend a couple hours if your local theater has booked it for Chinese New Year. There are many sorts of sequels, all with their various merits - the serialized story, the shifting genres, the attempt to recapture the same magic but with more resources. Monster Hunt 2 definitely falls into the "more of the first" category of sequel, with a story that is often vague enough that it like some combination of treading water until a climactic third part or only having time for a loose outline before shooting because the filmmakers knew they'd have to leave time for visual effects in order to hit a Chinese New Year release date. That's okay; that first was pretty good and this doesn't throw much of it away to get Wuba and his human foster parents together again. As it opens, Wuba and many of the other monsters in the human world are living in a new Village of Peace in the woods, and while young monster hunters Huo Xiaolan (Bai Baihe) and Song Tianyin (Jing Boran) miss the little tentacled radish, they know he would not have been safe with them. It turns out he's not safe in the village either, as it's attacked and his guardians (Sandra Ng Kwan-yue & Eric Tsang Chi-wai) just barely help him to escape. Fortunately, he meets up with BenBen, an adult member of his species, albeit one who works with con artist and gambling addict Tu Sigu (Tony Leung Chiu-wai), who owes a lot of money to loan shark Zhu Jinzhen (Li Yuchun), and though she'd accept his hand in marriage instead, he'd probably rather have the cash bounty on Wuba's head. Meanwhile, not realizing Wuba is in danger, Xiaolan and Tianyin are starting to have certain qualms about the Monster Hunters' Bureau - for every rising young star like Yun Qing (Tony "Yo" Yang Yo-ning), there seem to be a lot of people just as happy to kill monsters as capture them. Unlike a lot of sequels trying to scratch the same itch as their predecessors, Monster Hunt 2 opts to shake up the cast rather than bringing everyone back to repeat the same catchphrases, and this actually turns out to be a strength for the new movie. Bai Baihe and Jing Boran are back as Xiaolian and Tianyin, although they've got an easier, less contentious chemistry that comes from the tomboyish Xiaolian and the emotive Tianyin mostly accepting themselves as an odd couple rather than making any serious attempt for an interloper to get between them (in fact, Xiaolin more-or-less ignoring any attempt in that direction is something of a running joke). There's an enjoyable new group of supporting characters, from Da Peng as the Bureau's Q-equivalent (the one with the crush on Xiaolin) to the ever-reliable Tony Leung Chiu-wai as Tu. Leung plays the sort of scoundrel that is still worthy of his money-lender's affection, with Li Yuchun having fun chewing the scenery in that role. Yep, a week later, I get this posted. So much for trying to do it quick by not writing a whole lot, but all three of these movies were just good enough that the "don't pile on" instinct didn't kick in and but also had something in them worth talking about for good or ill. I skipped the family show in the early afternoon for the Animated Oscar Shorts, but settled in afterward for three movies, two of which had guests. 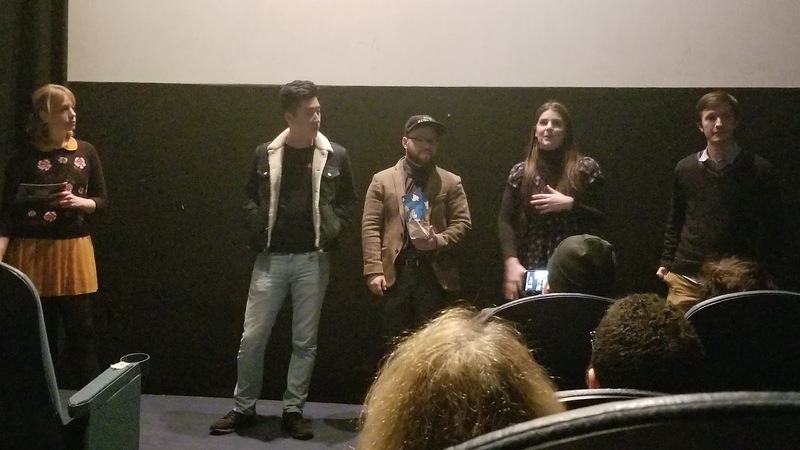 Left to right, that's Leandra from the festival and Flora cast members/producers Dan Lin, William Aaron, and Terese Marie Doran, with composer Nathan Prillaman on the right. 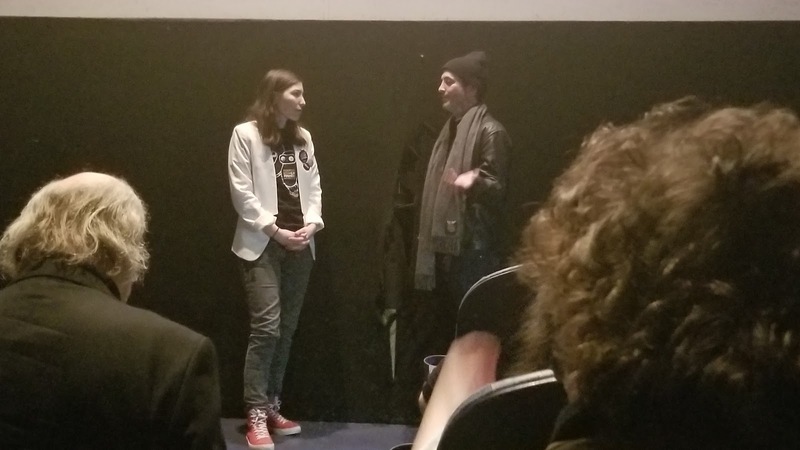 They're a pretty cool group, many of whom knew each other and director Sasha Louis Vukovic in college and were thus able to pull this movie together knowing their strengths and weaknesses, as well as what they had access to. Part of that was land, in that they knew someone who would let them shoot on their property without a lot of trouble, although they pointed out that it wasn't quite so isolated as you might think - there are a lot of scenes where, if you turned the camera 90 degrees, you'd see that they were not far from civilization at all. They also wound up having to redo all the sound in post, because it wasn't nearly so animal-noise-free as the plot required. Also, even a movie as low-budget as this can have 100+ effects shots these days, even if it's mostly removing mosquitoes from your eerily still forest or jet contrails from your period piece. Nobody came for The Gateway, but to be fair, they are Australian, and that is a heck of a flight. That's Andover director Scott Perlman on the right. Seems like a nice-enough guy. I did find it weird just how much of the film wound up being connected to Jonathan Silverman, who from his filmography just doesn't seem like a guy to get anyone particularly excited. Okay, finding out that he's played a character with your name is weird. Anyway, Perlman talked about how they wanted him at the start, but he dropped out both for timing and because there was potential tension with an ex-girlfriend in the cast, but then she dropped out, he was available when they were finally able to shoot, they talked about getting his wife Jennifer Finnigan a cameo, to wind up casting her as the dead wife who gets cloned multiple times, with Finnigan winding up being the best thing about the movie. It's genuinely weird how this works out sometimes, isn't it? Flora is a thriller that, like may first films, is built to work around pitfalls and get the absolute most that the filmmakers can out of what they have available, to the point where it sometimes seems that the characters and filmmakers are improvising in the same way. While that's not the most exciting way to present a movie, it can certainly make for one that catches the eye when reading a genre festival's catalog or a VOD menu, and in this case the results are not bad at all. Some of what makes it eye-catching is the 1929 setting, with four botany students - Ora Blackwood (Teresa Marie Doran), Matsudaira Basho (Dan Lin), Rudyard Corey (Miles G. Jackson), and Charles Horne (William Aaron) - are headed into an unmapped part of the woods to assist a professor on a survey, joined by nurse Avis Tasker (Sari Mercer) and Rudy's brother Haviland (Caleb Noel). When the professor doesn't meet them as planned, they voyage up the river and to the camp as planned, only to find it abandoned, and the provisions that were supposed to last them a month gone. They start to make plans to make do, but after a day or so they can't help but notice there are no animal and insect noises. The jazz-age setting that writer/director Sasha Louis Vukovic chooses is convenient in a lot of ways, and not just in the obvious lack of mobile phones and a setting where a reasonably-equipped expedition can still venture into unknown territory without the vague hand-waving of having supernatural forces mess up compasses and create impossible topology. It's also fun; it makes for period-appropriate music on the soundtrack, costumes which signal exploration, science, and adventure to the audience without it seeming like an affectation. Characters can drop references to being on the Discovery with Shackleton, and when it comes time to explain the scientific nature of the danger they face and what they're doing about it, it makes sense for it to be within the grasp of most of the audience rather than filled with difficult technobabble. The Gateway (also called "Alpha Gateway" because there's a good chance your cable company lists its pay-per-view options alphabetically) is a reasonably capable parallel-worlds bit of science fiction that relies an awful lot on security procedures being terribly lax in all versions of Australia, even the paranoid violent one. It's the kind of thriller that simultaneously hopes you'll be impressed by its twists and not notice the really questionable things necessary to get to them, but at least it's got a decent-enough cast to make the good bits work. Chief among them is Jacqueline McKenzie, playing scientist Jane Chandler, a physicist working on teleportation in an office she shares with Regg (Ben Mortley). She's got an extremely supportive husband (Myles Pollard) and two kids (Shannon Berry & Ryan Panizza), and while she and Regg haven't exactly cracked teleportation - their most successful attempt seems to have just disintegrated the apple they were trying to move across the room - they eventually figure out that they sent it to a parallel universe. Research is put on hold when that husband dies in a car crash, leading her to transport herself. And when it turns out that Matt lost Jane in this other world, where they have no kids, well, that fits together just too perfectly. My notes on this movie include some hasty calculations to try and convert the 350 petawatts for six seconds that this machine requires into the same units as my electric bill (at twenty cents per kilowatt-hour, each time Jane uses the device costs over thirty-one billion dollars American, and I kind of doubt that the exchange rate or different voltage makes enough of a difference that it makes sense for her to do so this casually), and that's just one of the many details about this project that don't make a whole lot of sense. As mentioned, it doesn't seem as though the people working on this project even do so much as lock their doors in any universe, and one might think that, even before things went further to hell, someone might ask Jane what her long-term plan was in terms of having a copy of her legally, verifiably dead husband around. There are a lot of things like that in this movie, unimportant if you're caught up and miss them, but kind of hard to overlook once they're seen, especially once director John V. Soto and co-writer Michael White start asking the audience to pay attention to details in the last act. Andover is just good enough that and audience may or may not be able to overlook how thoroughly misguided it is at a fairly fundamental level, to the point where it's actually kind of impressive how precisely writer/director Scott Perlman finds the no-man's-land between a deliberately heightened dark comedy and hiding from the cruelty of the premise. It's hard to recommend despite getting frequent laughs, and probably needs to hit a viewer just right to work at all. That's not entirely far off from the situation Professor Adam Slope (Jonathan Silverman) finds himself in after his wife Dawn (Jennifer Finnigan) burns to death in her glass-blowing studio and he decides to use his advanced cloning research to bring her back, especially once student Emma Grady (Scout Taylor-Compton) suggests a way around the issue of it taking a couple years for a clone to grow to adulthood. The trouble with that is, even if it only takes Adam three months to raise Dawn #2 to adulthood, she feels more like his daughter than his girlfriend. Which means, starting with Dawn #3, he's got to find various ways around the whole nature-versus-nurture thing. Perlman doesn't exactly hide from the obvious problem of how, if he wants to explore all the ways that this plan can screw up, he's going to need a lot of dead or abandoned Dawns; it's right in the opening flash-forward, one of the few times that using that trick to get the viewer's head in a certain spot is a net benefit. That's not necessarily even a bad thing; casually bumping off characters in the service of satire or a dark-themed comedy can be a lot of fun if you commit to that tone. And there's an argument to be made that Perlman does, that all the times a Dawn is thrown out as a failed experiment is just expressing the movie's themes in a metaphorical, larger-than-life way (I suspect this movie will play better in France, where that sort of vicious satire is more mainstream, than it will at home) - after all, if the science is patently absurd and dictated by the needs of the plot, why not the morality? In this week's theater news, it looks like the AMC at South Bay has started some sort of tiered pricing, with "Premium Zone" (the stadium seating that takes up the rear half of the theater) costing a buck more than the "Vanguard Zone" (the flat-ish section up front), and while I tend to sit up front anyway, this just isn't a good look. I suspect it will spread to Assembly Row and other local AMCs soon enough, and I kind of wonder how it plays with what MoviePass and the other programs like it will pay. I kind of like it in the "Vanguard", but I understand people think I'm nuts for that. They likely feel comfortable doing it because they will sell out a bunch of shows of Black Panther, Marvel's latest big 3D entry in the Avengers franchise (building on an appearance in Captain America: Civil War. It looks great, director Ryan Coogler has a pretty terrific track record, and the Afro-futuristic design promises to be like nothing we've seen in a blockbuster before. It gets a ton of screens at the Capitol (2D only), Fresh Pond, Jordan's Furniture (Imax 2D),the Embassy, Boston Common (including Imax 3D), Fenway (including RPX 2D/3D), the Seaport (including Icon-X), South Bay (including Imax 2D and Dolby Cinema), Assembly Row (including Imax 2D/3D), Revere (including XPlus & MX4D), and the SuperLux. The other big opening is Early Man, and it shouldn't be slept upon - it's the new stop-motion feature from Nick Park, of Wallace and Gromit fame, with local cave-dwellers playing a soccer game against invading Bronze Age men to determine who gets the stay. I am told there is a giant duck. I'm sort of mildly surprised it's not getting a 3D release, but maybe Aardman only renders their digital pictures in 3D. It's at the Capitol, Fresh Pond, Boston Common, Fenway, South Bay, Assembly Row, and Revere. Between those two (and a few other things), there's actually little room for Biblical epic Samson, which opens in South Bay and Revere. The TCM Classic for the week is The Philadelphia Story which screens Sunday and Wednesday at Fenway, Assembly Row, and Revere. Fenway also has a one-time screening of distance bikinig documentary MAMIL: Middle Aged Men In Lycra, on Wednesday evening. Kendall Square and The Coolidge Corner Theatre both open The Insult this weekend. It's the nominee for Best Foreign-Language film from Lebanon, a courtroom drama that springs from a confrontation between a Christian and a Palestinian refugee where the words were perhaps more damaging than the blows. Kendall Square also has a special screening of Kangaroo: A Love-Hate Story on Wednesday, with filmmakers Mick McIntyre & Kate McIntyre Clere on-hand to take questions after their film about how, while the rest of the world loves one of Australia's best-known native species, they're actually considered something of a pest there. The Coolidge is busy at midnight this weekend, with two "women in horror" offerings - A Girl Walks Home Alone at Night on Friday and a 35mm print of Jennifer's Body on Saturday - as well as the monthly screening of The Room on Friday. There's a "Science On Screen Jr." showing of Looney Tunes on Sunday morning to teach kids cartoon physics, and a 35mm showing of Cave of Forgotten Dreams on Wednesday as part of their Werner Herzog tribute that gives viewers a rare look inside the famous Chauvert Cave. It's also a holiday weekend, with the biggest holiday world-wide being Chinese New Year, and there are some sequels on tap for that at Boston Common: Monkey King 3 has Aaron Kwok returning as Sun Wukong, still on the Journey to the West and this time encountering a land of women and, if the posters are to be believed, seeing one member of his all-male party get pregnant. More kid-friendly is Monster Hunt 2, a live-action/CGI followup to the gigantic hit about the heir to the monster kingdom being raised in exile by two humans (although both could go in weird directions that American kids' movies generally don't if their predecessors are anything to go by). There's also Detective Chinatown 2, which follows up the obvious franchise possibilities of the first by having the mismatched buddies who previously bet in Bangkok's Chinatown reteaming in New York's. That one also plays in Revere, which also has Mexican comedy La Boda de Valentina and Portuguese-subtitled screenings of Black Panther for the linguistically adventurous. Apple Fresh Pond and Fenway hang on to Padmaavat with Fresh Pond also continuing Pad Man. They also open up Hindi political thriller Aiyaary, Tamil action movie Naachiyaar, and Telugu sci-fi flick Awe!. Fresh Pond also give half-schedules to a couple American indies - documentary Poop Talk is an irreverent doc on the universal subject of the title, while Looking Glass has Nicolas Cage and Robin Tunney buying a motel on a quiet stretch of road and finding strange things afoot. If you're like me, you were amazed that Cage is on pace to do a VOD-level thriller with the entire cast of The Craft by summer, but, surprise, Mom and Dad's Selma Blair wasn't in that one. Then again, at the pace he's making these things, he could still manage it. President's Day is the other end of the long weekend, which means the back end of Boston Sci-Fi Film Festival at The Somerville Theatre, which features a 35mm print of Superman on Saturday afternoon, and Muse (from one of the co-directors of [REC]) that evening before the twenty-four-hour Marathon running from noon Sunday to noon Monday, which ha a pretty decent line-up and a surprise 50th anniversary presentation teased that has me wondering if the Somerville has a certain newly-commissioned print to debut. With the sci-fi guys gone after Monday, they'll have an empty theater, which will be filled with the latest edition of the Banff Mountain Film Festival World Tour running Tuesday to Thursday, after having played The Regent Theatre on Monday. The Regent will also have one of their sing-along presentations during school vacation week, with Frozen starting Saturday and continuing daily matinees straight through next weekend. School vacation week also means The Brattle Theatre will be running their annual Bugs Bunny Film Festival, alternating 35mm packages of an "All Bugs Revue" (Friday/Sunday/Tuesday/Thursday) and "Daffy Duck and Friends (Saturday/Monday/Wednesday). They also have two special screenings this week: Multiple guests will be on hand to introduce a free screening of A Futile and Stupid Gesture, the story of National Lampoon creator Doug Kenney, at 10pm on Saturday. As it's a Netflix film, this may be your only chance to see it on the big screen, so get a pass and line up early if that's your thing. Then, of course, Tuesday is trash Night, with an a-yet-unannounced movie for your mockery. This year, at least, the films at The Harvard Film Archive celebrating the recipient of the McMillan-Stewart Fellowship are being offered free of charge, so you can learn about director Alain Gomis by seeing 35mm prints of L'Afrance and Andalucia without spending any cash. After that, it's a weekend of king-sized documentaries - Park Lanes by Kevin Jerome Everson documents an entire eight-hour work day in real time on Saturday and the finale of their Frederick Wiseman series on Sunday with At Berkley, which is just a hair over half that length. Then on Monday, they have their monthly "Cinema of Resistance" screening, this time around welcoming director Theo Anthony to introduce and discuss IFFBoston alumnus Rat Film. The Museum of Fine Arts has more of their Boston Festival of Films From Japan, including Over the Fence (Friday), Oh Lucy! (Friday), Takashi Miike's Blade of the Immortal (Sunday), and Teiichi: Battle of Supreme High (Wednesday). They also begin a run of rotoscoped Irani film Tehran Taboo with screenings on Friday, Sunday, and Wednesday, while two classic international satires - 1963's Il boom from Italy and 1936's French The Crime of Monsieur Lange - start Thursday. In between, Saturday is Stanley Kubrick Day, with A Clockwork Orange, Dr. Strangelove, and The Shining all screening. Emerson's Bright Lights presents two differently-ambitious 2017 films for free in the Bright Screening Room this week, with The Killing of a Sacred Deer on Tuesday and The Florida Project on Thursday. Discussion with members of the school's faculty will follow. The Institute for Contemporary Art has two free screenings with museum admission this weekend, with The Square playing Friday night and Ai Weiwei: Never Sorry the week's "Month of Sundays" show. They also have Oscar-Nominated Shorts this weekend - Live-Action on Saturday and Animation on Saturday and Sunday. The animated and live-action shorts will also be playing all week at the Kendall and West Newton, while the Coolidge keeps the documentary shorts around for another week, and CinemaSalem fits all three programs into their little room. Man, as much as I love the idea of the Sci-Fi Film Festival, it is really in the freakin' way this weekend! I'll somehow try to fit the Chinese New Year and Nic Cage films in around it, hang out with my brother for the first time in years, and then actually catch some of the others at night when I just want to sit down after walking around New Orleans all day.